In the course of research for his publication Bearing the Heavens: Tycho Brahe and the Astronomical Community of the Late Sixteenth Century (Cambridge, 2007; reprint 2011), Professor Adam Mosley compiled for his own use a large and invaluable list of early modern astronomical correspondence. Subsequently, and very kindly, he donated this metadata to Cultures of Knowledge. As a result we have been able to publish thus far in EMLO a catalogue of Brahe‘s correspondence, followed by the first of a number of installments of Kepler’s correspondence, which although based on the metadata supplied by Professor Mosley is being expanded and enriched significantly by Dr Francesco Barreca of the Galileo Institute. Now this week we are bringing out a catalogue for Giovanni Antonio Magini. And many more of Professor Mosley’s astronomers are queuing patiently in the wings. Magini, whose correspondence was published in 1886 by the Galileo scholar, Antonio Favaro (1847–1922), was an astronomer, astrologer, mathematician, and incumbent of the chair of mathematics at Bologna from 1588 until his death in 1617. Amongst his correspondents may be found some of the leading astronomical and mathematical figures of his day, including the luminaries Tycho Brahe, Christoph Clavius, Galileo Galilei, Johannes Kepler, Johannes Macarius, and Abraham Ortelius (whose correspondence — in case you missed it — we welcomed to EMLO just last week). With EMLO growing so rapidly, thanks in no small measure to the generosity, altruism, and meticulous and painstaking work of such scholar-contributors as Professor Mosley, EMLO is in a position to begin listing catalogues by theme, as well as by individual correspondent. Thus from this point forward, under the Thematic section of EMLO’s Collections index page, a number of interesting groupings may be consulted. 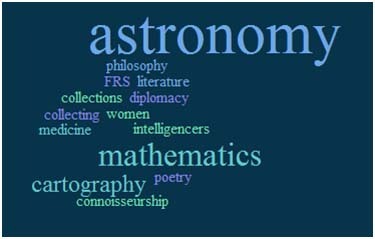 For the present, we have arranged clusters of correspondences on astronomy; cartography; collections of letters; connoisseurship and collecting; devotional literature; diplomacy; early modern women; Fellows of the Royal Society; intelligencers; mathematics; medicine; music; natural philosophy; and poetry. Of course, as more correspondences come into EMLO, the possibilities for thematic clusters increase and it will not be long before many more will be added. In addition, it will soon be possible for users to consult batches of correspondences by contributor, whether individual scholar, library, project, or publisher, and it is here that each donation of metadata — such as that made by Professor Mosley — may be viewed and celebrated as a whole. For the present, I hope you enjoy Magini as EMLO’s latest addition to the ‘stellar hall of fame’. Should you be in any way like me and prone to image what early modern individuals might discuss as they encounter each other in the Valhalla that is our union catalogue, suggestions may be submitted by email or, alternatively, the good old-fashioned way on a postcard . . . This entry was posted in Uncategorized on February 25, 2016 by Miranda Lewis. 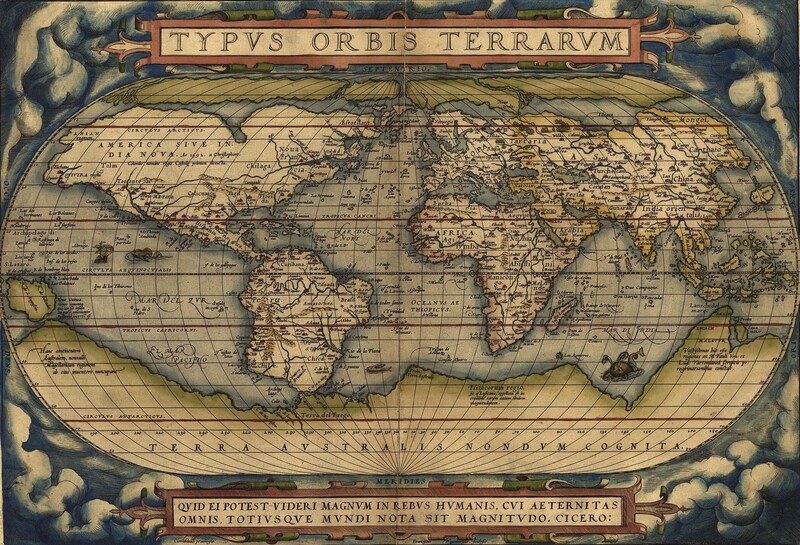 Abraham Ortelius, who thanks to his Theatrum orbis terrarum, is best known as the author of what is described frequently as ‘the first modern atlas’, was an extensive traveller: the son of an Antwerp merchant, he journeyed through the Low Countries, France, Italy, Germany, and crossed the channel to England, from where he moved on west to Ireland. Back in Antwerp, he began to compile and publish his own maps, starting with a wall map of the world and continuing with maps of ancient Egypt; the Roman empire; Asia; and Spain. In 1573, Philip II conferred on him the honour of the title of ‘his majesty’s geographer’, and today EMLO is truly delighted to be publishing Ortelius’s catalogue of correspondence. Fittingly, but to the intense frustration of early modern historians, the story behind the after-life of Ortelius’s correspondence is composed of travel and movement as well. Ortelius became one of the leading humanists of the Low Countries and was in communication with a large number of the leading European intellectuals of his day; some decades after his death in 1598, the bulk of his correspondence ended up in the custody of the Dutch Church in London, possibly as the result of a bequest from his nephew, Jacobus Colius the younger. There the letters remained safe and sound until 1862 when the remaining nave of Austin Friars, the Dutch Church in question, was destroyed by fire. Thankfully the letters were saved and were deposited in the Library of the Corporation of the City of London at the Guildhall. From there, at the end of 1884, they were relocated temporarily to Cambridge University Library to allow Jan Hendrick Hessels to prepare his edition for publication. Disaster befell the (now reconstructed) Dutch Church once again when, during an air raid in 1940, a German bomb razed it to the ground. To fund rebuilding work, Ortelius’s letters were dispatched for auction and sold through Sotheby’s, London, to an American collector, Dr Otto Fischer, who rehomed them in Detroit. A second sale was held, back again in London with Sotheby’s in 1968, as a result of which the letters were well and truly scattered across the face of the globe. Since 1992, Ortelius scholar Joost Depuydt, an archivist at the FelixArchief [City Archive], Antwerp, has worked meticulously to track down and reunite them virtually, and to add more letters which were not published by Hessels. The fruits of his ongoing research are now to be found here in EMLO and in an article in the current issue of Imago Mundi. This entry was posted in Uncategorized on February 17, 2016 by Miranda Lewis. This week sees publication in EMLO of the correspondence of the Dutch philologist, manuscript collector, and polymath Isaac Vossius. Son of the eminent scholar G. J. Vossius and his second wife, Elisabeth Junius, Isaac amassed over the course of a lifetime what was considered to be one of the era’s greatest collections of books and manuscripts and, ultimately, his collection was bought in 1710 for the sum of 36,000 florins by the University of Leiden, where it resides today. EMLO’s catalogue of Isaac Vossius’s correspondence, containing 1,702 letters in total, was pieced together by Cultures of Knowledge’s Postdoctoral Fellow Robin Buning, largely on the basis of his research in three archives: Amsterdam University Library, Leiden University Library, and Oxford’s Bodleian Library. The letters encompass the full spectrum of Vossius’s interests: he published editions and commentaries on classical as well as contemporary authors; he conducted historical studies; he was regarded widely as an important scholar in ancient geography, patristics, and chronology. Although Isaac caused controversy with a series of treatises on the age of the earth, in later years he shifted his focus to mathematics and natural philosophy. A religious libertine, just prior to his death in Windsor in February 1689, Vossius is recorded as refusing the sacrament until the pleas of his fellow canons convinced him that this was something he should receive, if not for the good of his soul in the life hereafter, then at least for the sake of their reputation. Unfortunately we know nothing about Isaac Vossius’s appearance: no portrait is thought to survive. Of course it’s possible that an image will emerge, perhaps from his years spent at the court of Christina of Sweden, or from the last two decades of his life in England. It is conceivable also that a portrait or print depicting him exists but is mislabelled and lies tucked away masquerading as someone else. We can but hope. 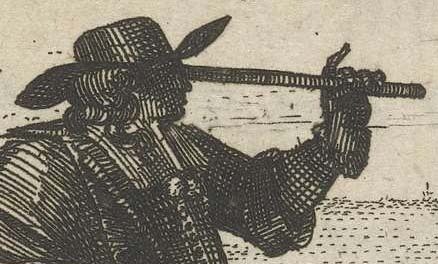 And, whilst on the subject of identifying people, EMLO users might be interested to note that we shall be posting shortly a list of early modern individuals for whom little information is available at present but about whom a scholar or project would like to know more. I shall write in a future blog about this ‘wanted list’, but in the meantime should anyone wish to add a name — or names — please be in touch and let me know. Details of those seeking information will not be made public and should fellow scholars be able and willing to help, responses will be forwarded straight to the scholar or project posting the name. For now enjoy Isaac Vossius, but please keep an eye open for his portrait! It would be good to meet him face to face. This entry was posted in Uncategorized on February 8, 2016 by Miranda Lewis.